“yay! no more work & no more Xmas dinner mayhem! Tis the time to slow pace & rest!” … But instead…, my body decided to go in to ‘rest’ literally & got me bedridden with the most drowsy flu for three days. It was the “achy-everywhere with heavy-head” kinda flu, & not the fun “stay in bed & catch up with a spot of reading while partner-brings-hot-milk” type. Well, if I tell you that I made twice as much as usual on the last Saturday (20th) at the market, maybe you’ll realize that I put in twice the workload for it. Hence it is maybe not much of a surprise that my body thought it best to stick me in a bed to re-energize before the New Year’s Eve wake-up-athon (which this year’s lasted til 3.30am, hick!). 32 boxes of assorted chocolate truffles, 16 flourless chocolate cakes, 3 lemon drizzle cakes, 14 eight-inch tarts, 12 five-inch tarts, as well as the individual heart-shaped ones & the usual tower of brownies. That is, in ingredients terms, I used about 12 kilograms of chocolate, roughly 8 kilograms of sugar & 6 kilograms of butter. It truly was the record mega make-athon ever. When I list the things I’ve made like this, even I must say, it’s unbelievable. When some customers ask where I make it, & I say at home, with a standard home-oven, they’re surprised that I can produce so much, & as D puts it, at this rate, one-day, the oven is gonna go caput…, quite possibly soon. I piped, rolled & coated over 500 chocolate truffles. Remembering my lesson from previous years’ Christmas market day, I pre-packed 20 boxes on Friday night. I think I finished around 2.30am. Come Saturday, I asked D to drive me & the goods to the market earlier than usual to set-up. THIS day is THE best sales day of the year for a cakes & chocolate stall like mine. As I’m going to take all of January off, tis the time to do as much as I can. The chocolate boxes went one by one. But hang on? Isn’t the pace a bit slow? My sleep-deprived head spun thoughts of “Oh no…! ?”‘s… The cake sales were slow on the up-take too. Afterall, it was a gappy 5 days more to go til Christmas, & then there is the purse tightening credit-crunch… It felt as though there were less visitors this year. I glance at the wall-clock in the burger shop situated opposite my stall. Truffle sell-out time this year was 1:30pm. 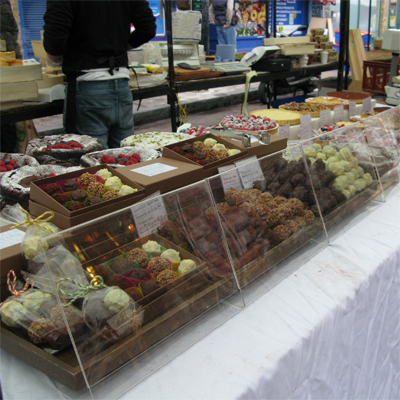 In Year 2006, I finished selling truffles at 11:30am, then Year 2007 was at 12:40pm. It’s taking longer to sell every year it seems, but then again I’m making more & more every year so maybe these numbers don’t really mean a thing. The previous Saturday (the 13th), it was the complete opposite. It wasn’t my worst-ever sales day to date, but it certainly belonged to that end of the spectrum. Double rain drop sign was a permanent show on the weather forecast that week, & no surprises, that Saturday started with pouring rain. The tarpaulin roof cover had holes & some of my chocolates & cakes were rained on. I was furious & frustrated. I urged the market-boys double up my roof cover. They eventually did a good job. I just discovered your blog and I LOVE it :-)! 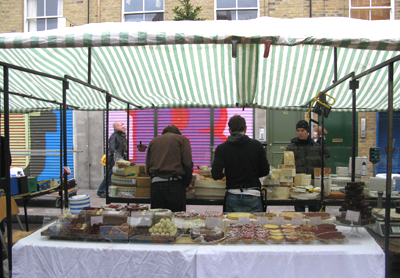 It’s really great and it’s such a nice idea to do a market-stall. I just started my own mini-business selling Italian pastries but right now I just do it at home. I would love to own a shop or a stall like your :-)! I’ve been reading your older posts and I’m finding that what you write really touches my heart. That’s because, I think, although it looks like you’re talking about food, you are in fact talking about things that are bigger — love, life, dreams…. you know what I mean. I particularly liked your entries titled “I have a dream” and “Meet the maker”. May your dream come true someday (soon). Hello Cocopuff!! Wow, what a lovely comment… It is sooo nice to hear what you thought about this blog. – My dream seems to be on hold, probably indefinately (!). It seems to change slightly, or maybe it’s ‘evolving’. I’m currently thinking maybe it’s not a patisserie/ cafe I want anymore, maybe I’d like to publish a magazine… ha ha, don’t know! I’m so sorry for your travails, and so happy for your successes! Sounds like a well deserved month off. I just found your blog through Chocolate and Zucchini, and I love it already, I can’t imagine how you do all of this out of a home oven! Love your blog – I live in Hackney so I’ll try and stop by when you’re back open in Feb! Hello June2! Welcome to my blog! And thanks for the link! I’m now gonna get a cuppa & sit down and read it! I live in Massachusetts. My daughter, who is a graphic designer, and I were by your stall in November. She lives in London, so I have sent her the link, and I hope she will be back to get goodies some Saturday. Hello Martin, thank you for dropping a message here ;-) I’m happy you have found my blog! I’ll look forward to meeting your daughter again soon! I don’t know if you remember meeting, but I used to live in Kent and visit your stall sometimes, and have now moved to France. Well, the news is that my son is getting married in London on 12th March, and we were wondering if you take orders for Wedding cakes? For say, 55-60 people. i have been blown away and oh, so inspired by your photos and posts, and the work that you do and the magic that you create. i love cooking and baking, and chocolate oh so delciously decadent chocolate drives me wild. i am a college student in california and in the midst of studying and work, i host dinner parties (always, with dessert) as a way to relax and share deliciousness with good friends. this is my senior year, and while i am planning for life post college, i am thinking about how amazing it would be, even to spend a few months or weeks, to travel and learn from chefs around the world. til then, i will learn from here in my bright yellow kitchen off the pacific coast. cheers to you! and i look forward to reading and learning more! Ofcourse I remember you. – I remember you came to the stall just before you were leaving for France! Thank you very much for your enquiry. Hi Tamami, I think I found your blog at C&Z. I went back and read the whole thing today. There’s so much I want to congratulate you for, … like being a good Mom to your son, for your beautiful newborn, your talent for baking, not to mention blogging, and so forth…!! You’ve got another regular reader in Tokyo… It really is a shame I can’t just stop by and pick up your goodies tomorrow. I could have added to sales, pity. Well, good luck! Hello Rita,don’t tell me you read the whole blog, in one day?! – thank you*!!!!!! Hope to hear from you again. I must take a trip to Broadway from South London – was there twice in the past 6 months but your blog and pix make me want to visit again! What equipment you use ie Kitchen Aid, Magimix etc to help make cakes etc. Do you actually do it all yourself or do you have help? I think you’ve got loads of talent. Hope to visit v soon. Hi Snooky! Thanks – it’s pretty straight forward to set up a stall actually! I am a personal trainer but my girlfriend lucia runs a veggi market stand we would like to know where you brought your sneeze guards (the plastic shields that protect your food). Many thanks Kristian And Lucia. Hello Kristian, I honestly don’t remember which company it was, but it was purchased online, after googling for search terms like ‘display stand’. Hope that is of any use…! Hello Felice, thank you for sharing your idea! Hi there, I was wondering where you got your sneeze guards? I’ve been having a terrible time trying to find some for a market I’m hoping to be in. Thanks so much!